Posted 6/14/2016 6:11pm by Jim Baughman. It’s a happy day on the farm today. As I am writing this farm news blog I’m watching the much needed rain fall. Stuck with four days in row of temperatures over 90 degree and the last rain fall over ten days out I was beginning to get very worried and very weary from late night watering. With day temps in the 90’s and full sunshine it does very little good (and sometimes can be damaging) to water crops during the day. This only leaves us with the last hour of daylight and the first couple hours of daylight for the watering to be effective because it will more or less evaporate or bake the ground so crusty nothing will grow. With night fall not approaching until 10:00 PM these days it has made for some late nights and early mornings the past several days. We direct seeded or winter squashes and pie pumpkins the end of last week with the hope of a few pop up showers to water the seeds and germinate them. The rain went around the farm each for 5 days. With fear of the seeds not germinating and working with a closing window date for winter squash we began the desperate chore of hand watering hundred’s of row feet of planted squash. Each seed had to have a splash of water each evening until we saw signs of germination. A lot of effort but it worked. By Monday morning we started to see plants popping thru the crusted soil. With the much needed rain today we should see them take off beautifully. Chip and Dayton have worked frantically the past 2 days installing irrigation lines in fear we were headed into a real dry spell. It was a job that needed to be done sooner or later but we didn’t expect to need it quite this early. Thankfully it rained and hopefully it will cool off a bit. Planted the past week on the farm: Butternut, Acorn, and Kabocha Winter Squashes. Pie Pumpkins. Cilantro, Basil, and Green Onions. We transplanted Egg Plant and the last of the Sweet Peppers and Hot Peppers. Our high tunnel tomatoes are looking good with lots of small green tomatoes on them. We should have sugar snap peas, summer sweet onions, and new potatoes very soon. In the shares this week: Mesclun Salad Mix (a mix of lettuce, spinach, and any other greens we have growing). Kale, spinach, radishes (see recipe), and zucchini. New this week will be cucumbers make sure to check out the recipes for a nice refreshing cucumber dish. Posted 6/8/2016 8:03pm by Jim Baughman. The weather has been beautiful the past week or so. We had a dry out and got rain over the weekend just when we needed it. But you know with farming there is no way you’re going to get the perfect week. It’s always something. Towards the end of last week the tractor broke down. Hoping it was the simple thing, like ran out of fuel (the fuel gauge only works when it wants to), a good fuel up, purge the lines and go. No. Nothing seemed to work. It would not start. Chip is more mechanically inclined then I so we gradually tore into it a few hours a day trying different things and gradually had the tractor tore down in the middle of the field with parts all around. When you have these situations I think it is human nature to think the worse. I think Chip was googling and you tubing everything he could to find answers. Come to find out and just happened upon chance it was something very simple. There used to be a safety kill switch on the seat of the tractor, get off the seat the tractor shuts off, not very practical in the real world of farming. Years ago I bypassed the switch. Well my bypassed wire (located under the seat of the tractor) had come undone not allowing the tractor start. After a few stressful days of tractor down time it’s back to much needed field work. Oh, I almost forgot the fresh cut hay. As I am writing this letter this evening they are cutting hay on my property. If you have never experienced being around a farm when they are cutting hay it is one of the most wonderful aromas I think there could be. Fresh cut hay smells very sweet but will last for only a few days around the property. A true reward and balance between stress and relaxation. Planted this week: Not much planting we mostly have been working on cultivating and weed control. The recent rains have really brought on the grasses in the growing beds. We have managed to transplant the Basil to the field and plant our succession plantings of greens like lettuce, spinach and other salad greens. We hope to seed our winter squashes, pumpkins, and melons before the week is out. We are really behind on these crops and the window is just about to close. I think we can just pull it off though. In your share this week: Gold Beets, Spring Lettuce Mix (see recipe), green onions, and radishes. The Zucchini is coming on and I think we may just have enough for everyone to have one. Good news the Asparagus is finishing strong and I think I’ll have enough for all members to have one more taste of this spring treat. If you do not receive Asparagus this week we will substitute something and get it to you next week. Posted 6/1/2016 4:39pm by Jim Baughman. The Memorial Day weekend has now came and went. I hope all had a chance to take a day of rest and relaxation over the weekend. The farm crew and I took Monday off for a much needed break from the farm. As much as we enjoy what we do it can get tiresome and at some point we all need a day or two to get away. Today it’s back to work, a little behind with a big to do list, but rested and ready for the task at hand. The weather has continued to cooperate and allowed us to start our fall crops of sweet potatoes, winter squash, pumpkins, and midsummer melons. Although as of this writing we were not able to get all of these planted we got a really good start on prepping the soil, laying mulch, and transplanting some of the sweet potato slips. These are all warm weather crops that are so critical to our fall and winter sales. Also planted this week will be the remainder of the sweet and hot peppers and eggplant transplants. We are a little late on transplanting our peppers and eggplants but they should be fine if the weather holds its current pattern. In your share this week: Gold Beets, these beets are a beautiful gold color inside and out with excellent flavor. They have some really nice tops on them that are wonderful sautéed with a little butter, garlic, and onions. Also in your shares, Carrots ( don’t forget to remove the tops off the carrots if you are not going to eat them right away this will help them store better), and Red Stem Spinach. Some shares will receive Kale while others will receive Napa Cabbage. Shares that have not yet received Asparagus will receive theirs this week. Posted 5/25/2016 6:44pm by Jim Baughman. Sunshine and dry out at last. The birds are happy, the worms are happy, and Farmer Jim is happy. What a difference a week can make. This week we have been starting work at the farm to the sounds of Bob White Quail and Turkeys calling in the morning sun. As the soil is drying allowing us to work it we have been seeing many worms a true sign we must be doing something right in terms of building soil health. Chip, Dayton, and I have been scrambling like crazy to get as much planted before anticipated rain is to return mid to late week. In just the few dry days we have had we have been able to work much soil and cultivate many crops that were on the verge of being consumed with weeds. And oh what a difference it makes to hear the birds calling, feeling the warm sun and light breeze as we work each day. Planted this week: Cabbage, broccoli, kale, kohlrabi, heirloom field tomatoes, beets, Swiss chard, salad greens, spinach, cucumbers, green beans, and zucchini. With hopes of a few more crops before week’s end. Welcome Emilee Egnew. Emilee is this year’s Purdue intern that will be working on the farm as part of a 3 year study on Biochar. Emilee is from Greene County and studies agriculture at Ivy Tech. Emilee started this week. Biochar in its simple definition is basically ground wood charcoal that has been added to the soil. Biochar absorbs, retains, and gradually releases minerals and nutrients into the soil. This is year 2 of the 3 year Purdue study which involves 4 other similar farms across the state. In this week’s share you will receive carrots (the carrot tops are edible), kohlrabi (see attached recipe), spring lettuce mix, radishes, and green onions. Some shares will receive red stem spinach and some shares will receive bok choy. A few shares will receive asparagus as we continue to distribute to those who have not yet received it. Posted 5/18/2016 7:41pm by Jim Baughman. It’s been chilly and blustery out the past week or so. As many of our returning members know I write (complain) about the weather a lot. I can’t help it. The weather is so critical to a farmer’s day to day activities and outcomes that it is always on our minds. Already this year we have had the wind (in April) take down one of our hoophouses, one week ago we had a hail storm that shredded our new spinach bed making this week’s spinach crop unharvestable, the past 3 weeks it seems to rain every few days just about the time it dries out enough to work the soil. One month ago we were at 80 degrees and the past few evenings we have been below 40 with threats of frost. Somehow through all of this Chip and Dayton (the farm crew) have managed to keep planting and maintaining our existing crops in order to delivery weekly shares of fresh produce. It seems that some crops may be stalled out with the cool weather and lack of sunshine we know that with better weather in the forecast we will soon see their bounty. Bring on the sun and warm temperatures. Asparagus. Asparagus is a very seasonal crop. It is only available in this region during the mid weeks of spring. We do grow asparagus on Freedom Valley Farm however it takes several years to establish once established it grows for 15 to 20 years. Some members will be receiving asparagus each week for the next 3 to 4 weeks. The current established planting does not provide enough to fill all the shares in one week so I will be adding what we have each week to some shares with the goal being that every member will get a taste this year. My hope is that we will someday have enough of an established planting to provide more to our members in a single season. In your Shares this week: Bok Choy (see this week’s recipe link), Scallions aka green onions, Spring Lettuce Mix, Salad Mix, Green Garlic, and Asian Turnips. Posted 5/10/2016 8:14pm by Jim Baughman. Welcome to our 2016 CSA spring/summer season. The farm crew (Chip and Dayton) and I have been busy the past 2 months doing everything possible, weather permitting, to get the season off to a good start. Even though the cold spell we had a few weeks back and the more current rash of thunderstorms we feel the farm is off to a good start. This will be the first year ever that we have had all of our potatoes, onions, and high tunnel tomatoes planted before the end of April as they should be. Even though the recent weather has delayed a few crops we had hoped to have in your first CSA share we feel we have a good bounty of fresh greens and few other treats to get things started out. For those of you who may be new to our CSA or any CSA for that matter, you will find that your weekly share will be very seasonal. We strive to provide as much variety as possible each week, and to fill your shares as if it was coming from your own garden. We will always push the limit to bring you fresh produce that is in season for our region. The season will change throughout the 24 weeks of your CSA. Starting with lots of greens like lettuce, spinach, salad mixes, radishes, green onions, and braising greens. As warmer weather and daylight allow you will start seeing more items like carrots, beets, cabbage, and broccoli. Warmer weather will bring on summer squash, tomatoes, pepper and egg plant, green beans, and potatoes. The end of summer will bring on fall type crops like sweet potatoes, onions, and a return of many of the spring crops like salad mixes, beets, and carrots. We also strive to plant many crops in succession throughout the season in order to keep up with variety. Greens Salad Mix. A mix of greens, primarily Asian Greens that can be spicy, flavorful, and very high in nutritional value. This mix makes a great stand alone salad or can be mixed with other greens like lettuce to add more flavor. This mix can also be sautéed or stir fried as you would mustard greens or other large leafy greens. Salad Turnips (aka Asian Turnips). A spring and fall treat. Much milder than regular turnips. These salad turnips can be eaten raw, sliced or grated into a salad, roasted like you would roasted vegetables 0r sliced mixed with sliced potatoes and made into an Augratin. The green tops are also good sautéed or used for stir fry. Green Garlic (aka spring garlic). A baby version of full grown garlic that looks like a large green onion. This garlic is very mild and can be used in any dish that you would use garlic bulbs in. Slice and or dice the white bulb and green stalk. Green garlic will store for several weeks in the frig. I hope you enjoy your first share. Posted 2/20/2016 6:04am by Jim Baughman. Posted 12/31/2015 9:40am by Jim Baughman. from 9:00 am - 12:30 pm. New this week we have purple Kohlrabi in addition to our other fresh produce. Here is a picture of Chip harvesting the Kohlrabi for you buy at the market! Posted 9/23/2015 7:22pm by Jim Baughman. It’s been a while since I have updated you on the farm. This being the first day of autumn and maybe the first time I have felt like I have had a breather in the past month or so I’ll try to catch you up. The past month has been hectic to say the least. With Katie, our summer help, going back to school the first of August it has left Chip and I to try and keep the ship upright. It hasn’t helped in that I have had a rash of dental problems (2 filling replacements and a root canal in the past 3 weeks). All in all we have somehow managed to get the CSA shares out and to get to market each week. We have really had some good working weather the past few weeks although we could use a little more rain. Go figure - after all the rain we had in June and July it has been really dry, almost drought like for the past 6 or 7 weeks. With only 3 weeks left in the 2015 CSA season (after this week) we are headed down the homestretch and I feel we just might make it. The dry conditions have made it extremely hard to germinate lettuce, spinach, and salad greens. This will be the first year ever that I have headed into the fall season without greens. We do however have a good planting of kale, cabbages, and chard that will be in the shares the last few weeks. Also on the way will be more green beans and hopefully some sugar snap peas. Unfortunately we were not able to get our winter squash and pumpkins out due to the rainy weather in June so we will not have those items in the shares this year. We did have a somewhat pleasant surprise today while cleaning up and out one of the tomato greenhouses we were able to come up with enough tomatoes to give everyone a few in this week’s share. They are not the very pretty, kind of small, and may have a few bug bites but what can we say the very last of the last tomatoes for the season. In your shares this week you will find kale and all red potatoes (red skin red flesh). Make sure to check out this week’s recipe for kale, potato, sausage soup. Also in the shares will be kohlrabi, beets (the tops on the beets were pretty crappy so we nipped them off this week), and the few tomatoes I mentioned earlier. 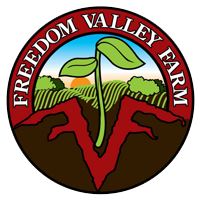 I’m sad to say that Freedom Valley Farm will not be offering a fall/winter CSA this year. Offering and maintaining a good fall/winter CSA requires that we would have a good supply of winter storage vegetables like winter squashes, sweet potatoes, onions, and garlic. We have struggled with all of these crops this year due to the wet conditions back in June and July. We do plan on having fresh greens throughout the winter months and will be selling at both the Bloomington Winter Farmers Market and the Indy Winters Farmer Market starting the first Sat of December through March 2016. Posted 7/29/2015 9:37pm by Jim Baughman. It seems the rain has finally stabilized somewhat, or at least it has in the area of the farm. I actually welcomed the brief shower we had this morning as we have now begun to need some rain to help germinate some of the new crops we planted in the past week. Even with the rain subsiding we have seen much damage and crop loss on the farm. As I have mentioned before we have seen most of or root crops like carrots, onions, and garlic rot in the ground. Most of the heirloom and cherry tomatoes are succumbing to blight and we have lost a planting of zucchini to powdery mildew. This being said we have a pretty good crop of beefsteak tomatoes, potatoes are doing good so far, and green beans have come through the past week or so. All of this leads me to let you, the CSA members, know that we may struggle a little in coming weeks to fill the shares or provide the variety of different crops that we had planned on or have been used to. We are planting and replanting as fast as we can in order to have enough produce to finish strong in the late summer and fall. Most crops fall into one of three growing periods: 30-day, 60-day, and 90 or more days. We are past the time to plant anything that will take 90 days or more because that will take us into frost and decreased sunlight. That leaves the 30-day and 60-day crops. We will do everything we can in order fill your share each week and keep planting in the hopes of finishing strong in the fall. Okra. Something new for this season. Please try the grilled okra recipe, which can be downloaded from the link provided in this week’s email. We are harvesting okra much smaller this year and I have found it much better in recipes and even for eating raw. Beefsteak Tomatoes. You’ll receive a lot of these over the next few weeks. Green Beans. Last week for these until the new crop comes in. Potatoes. These have done well. I’ll try not to overload you with them, but we have a lot. Basil. A small bunch. Try the bruschetta recipe, also linked. and a Cucumber rounds out this week’s share. P.S. Farm Tour News. The Bloomington-sponsored annual farm tour was this past Sunday, and this year Freedom Valley Farm was the host. The turn out was the highest ever: 80 people either rode the tour bus or drove out to the farm, including four of our CSA members / families ! There were about 100 guests altogether. Chefs cooked a great meal and everyone enjoyed socializing. I just wanted to send out a big thanks to all of you for making the tour at Freedom Valley Farm one of the best ever. It had a great feel. The farm looked beautiful, the set up lovely, the food fabulous and most importantly everyone was so welcoming, setting the vibe for an engaging, interactive, educational and fun evening. It's such a pleasure to work with all of you! If you have any evaluative notes, please send them my way and I'll compile them to assist us in planning for future tours. I'll be sending a survey to participants and share those results, as well as the evaluation notes in the next couple weeks.